Kendall Conrad Designs – WHAT IS JAMES WEARING? My friend Nina Griscom called recently to let me know that her gorgeous super chic friend Kendall Conrad was in town having a trunk show. Everyone knows I love a good bag and of course I made a point to visit – I am thrilled that I did! Not happy with the selection of bags she was seeing, Conrad’s earliest designs were manufactured with the enlisted help of a local saddle maker in Santa Barbara. These early efforts evolved into the world class Kendall Conrad Designs that we know today. In the creation of her magnificent bags and accessories, Conrad draws upon a great variety of influence, including her early world travels as a model, as well as her deep rooted Spanish heritage (her father was a bullfighter!). Here I’m trying to decide between the alligator bag No 9 or the chocolate Viajero bag. We are so conditioned to think in terms of either or, I always say “Why not both?” The only limitations are the ones we create! 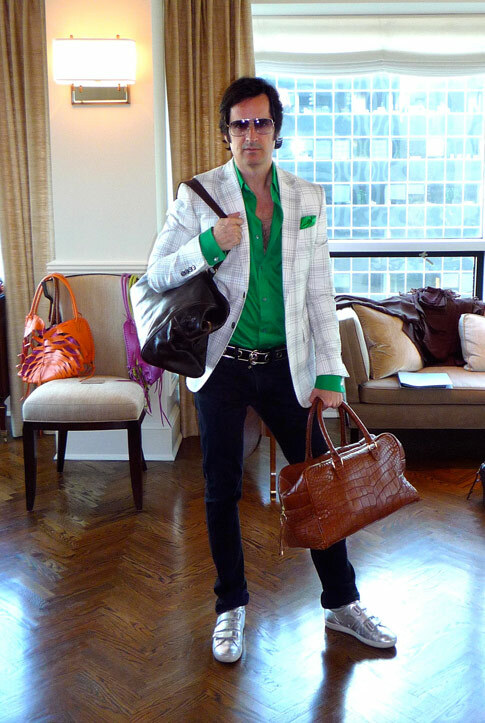 Admiring these handsome bags I’m wearing a white and black windowpane plaid jacket and a Kelly green French cuff shirt both by Gucci, a Kelly green silk pocket square by Ralph Lauren and vintage moonstone cufflinks, Diesel black skinny jeans, black patent leather belt with silver leather trim and grommets by Gucci, Dior silver leather sneakers and sunglasses.